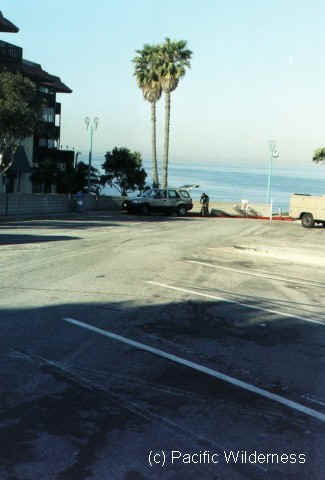 A short distance from the Parking lot is the Stairway leading down to the Beach. The steps (68 of 'em) are easy both up and down as they are spaced nicely and not too steep. Hand-Rails on both sides provide sturdy support for Divers both coming and going. Watch for sand on the concrete because it can make the walk a little slippery - Use those Hand-Rails! Water entry is relatively easy in light and moderate surf. The shore is smooth sand and so is the entry. Do heed caution though upon entering because there are some big valleys in the sand a short distance off shore. The surf here can get nasty - we've seen it pretty big, so only enter if your comfortable and dive to your ability. Depth will be about 15 - 25 feet until you reach the "Canyon" wall about 100 yards off shore, from there it gets Deep pretty fast. Visibility is generally pretty good for our coast, 10 to 25 feet with occasional 40-45 foot visibility during deep water upwelling. Usually there is no noticeable current, but once in a while there may be a light southerly current along shore. More Advanced Divers will enjoy diving the "Canyon". About 100 yards out there will be a fast drop-off from the 30 foot depth at the top of the wall to about 70-80 feet in a matter of about 30 yards. If you keep heading out depth will continue to drop consistently to about 130 feet - We recommend not going further, you won't miss anything and we do want you to come back! Exiting the Surf Zone here can be a bit tricky at times. The main thing you'll notice here is the sand is very "Soft" near the shore and you tend to sink in while you're trying to exit. In addition, there's a slight drop-off just before you exit - so combine the drop-off and soft sand and it can be challenging. Lots of Sand for one thing! Sand Bass, Bat Rays, Calico Bass, Tree Fish, Cabezon, Giant Kelpfish, - Blackeye Goby, California Halibut, California Sheephead (occasionally), - Senorita, White Seaperch, Opaleye, Leopard Shark, Horn Shark, Giant Crab, and lots of little critters anywhere there's a hide-out. Night Diving is Fantastic here, so don't rule it out! During the months of January and February don't miss out on making a night dive or two here to see the Squid lay eggs. This will be an unforgettable dive...coasting in the canyon at about 65-75 feet, pitch black except for your Dive light - when suddenly you spot something.... thousands of squid eggs carpet the bottom, translucent white sacks the size of your thumb. Side by side by side as far as you can see - It's like floating on clouds! We'll, that's how it was for me anyway! Redondo Beach has great facilities for Divers at this location. Main Restrooms and Showers are located at the base of the Beach Access Stairway and are usually opened at about 6 am. There are Several Freshwater rinse showers located just outside the Restroom entrances. Men's and ladies restrooms are normally pretty well kept. Ladies, the toilets are stainless. so be prepared - they're cold! The Picnic Area has nice Grass Coverage and is also we'll kept. If you plan ahead you can secure a picnic table and Barbeque Grill. The Redondo Beach Pier is within easy walking Distance and has lots of shops and Restaurants if you'd rather let someone else do the cooking. Parking is normally plentiful early in the morning - even on weekends. But if you arrive later than 9 am in the summer you may have difficulty parking anywhere near the beach, so we recommend a 7:00 or 8:00 am arrival. Parking is metered at all 72 spaces, so you'll need plenty of Quarters because that's all the meters' take. Parking Costs are $0.25 per 12 minutes or $1.25 per hour - so plan on at least $2.50 per dive. If you arrive late, there are 1,200 more spaces underground at the Pier, but it's a heck of a walk in full gear - something you'd be better off avoiding.